Marie Antoinette is sometimes credited for refining the rococo style that marked the “reign” of Madame de Pompadour, Louis XV’s most brilliant and influential mistress. The Louis XV style, a French variant of the rococo, can be illustrated by this photograph from the Musée Nissim de Camondo in Paris. The reign of Louis XVI and Marie-Antoinette witnessed an abrupt reaction against the rococo style,. The classicism, straight lines and simplified design of what we call the Louis XVI style stand in sharp contrast with the earlier exuberant curvature of rococo. How much of the neo-classical Louis XVI style was inspired by Marie-Antoinette herself remains debatable. In fact it stemmed from the discovery of the Roman cities of Pompei and Herculaenum in 1748, before Marie-Antoinette’s birth, and rococo was already going out of fashion before she became Queen. What is certain is that, as her taste matured, Marie Antoinette promoted a decorative style that was dramatically different from rococo. 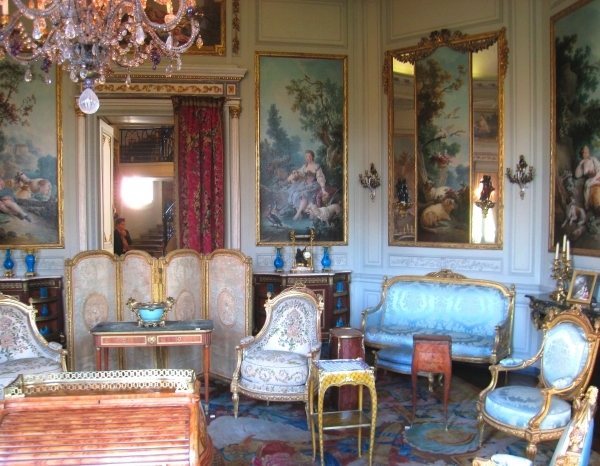 A good example of her taste in terms of decorative arts is her boudoir at the royal palace of Fontainebleau. Note the exquisite mother-of-pearl furniture, which was part of the Marie-Antoinette exhibition at the Grand Palais.